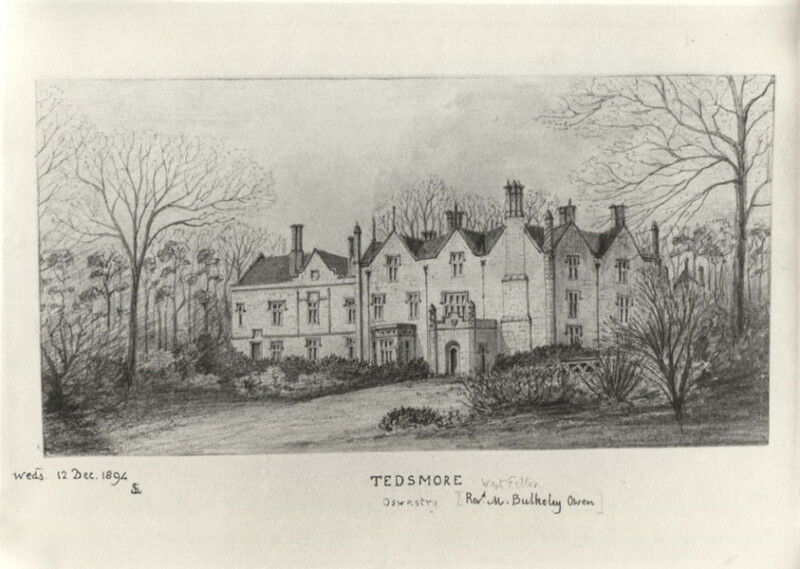 The family of Hatchett having married the heiress of Tedsmore, assumed the name of Owen, and in the 18th. century resided here. The house was re-constructed in the early revival of the Gothic style about 1840. The views on all sides, from the elevated ground on which the house stands, are extremely fine, and there are many rare plants in the shrubbery, which is protected from the N.E. There are few places which equal Tedsmore in the beauty of the views, which can be seen from the windows. The rocky and most precipitous side of the Breidden appearing through a vista of cedar trees, is the most remarkable of all, the deep purple of the distant hill, contrasting finely with the deep green of the foliage. The present owner (1880) is the Rev. Thos. Mainwaring Bulkeley Owen.